Shackled City binnen de Wereld der Magieck - 326 pagina's bekeken afgelopen 24 uur! 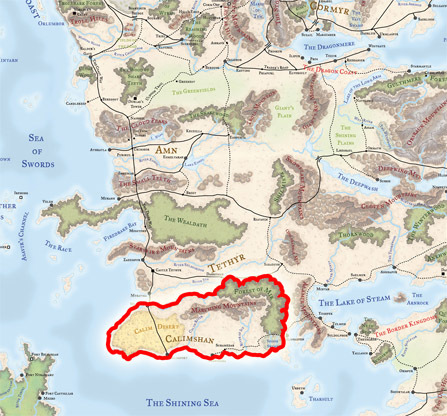 Calimshan is a nation which covers the southern corner of West Faerun, including the Calim desert and the Spider Swamp. sprawling port-city of Calimport, home to emperor Syl-Pasha Ralan el Persakhal and the many powerful wealthy nobles called pashas. Other major cities includes Memnon and the coastal city of Schamedar. The pervading view of the average Calishite is they are the rightful rulers of all the land south and west of the Sea of Fallen Stars. They have a tendency to look on the northen cultures as being short lived barbarian cultures barely being worthy of notice. This however does not stop them with trading with these nations as they are trading rivals with Waterdeep. See the Forgotten Realms Wiki page for more info. Gepost door Pepijn op 1 februari 2009 om 13:07 uur. De 1e speeldatum moet nog geprikt worden.